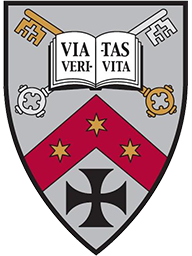 The Gregorian Institute is Benedictine College’s initiative to promote Catholic identity in public life. These prayer resources are our most visited pages each week. Some suggestions, based on St. Benedict and Father Michael Gaitley. Passion of the Christ, Modern Martyrs, or Stations of the Cross for Sinners. This popular guide guides you step by step through the hour, with Scripture and other prayer aids. A link to a printable version is included. Reasons to say the Daily Rosary. Our popular aids for adult confession. A step by step guide to confession including an examination of conscience and an act of contrition. Why is confession so important? Reasons to remember and share. The meaning of Christ’s sacrifice as presented in Mel Gibson’s film. Some of the most impressive stories of faith amid persecution are happening in our own lifetimes. Inspired by the message of Our Lady of Fatima, these meditations look at the consequences of our sin and the possibility of redemption. How do you pray a daily meditation? A step by step guide. Embrace the faith at home: Quick rules to live by. Enter more deeply into Mass with these quick tips. See the ‘Proudly Catholic Films’ Gregorian readers picked as their favorites. Masculine virtues and the movies that promote them. The virtues of femininity on film.